While artificial lawns are decidedly a lower maintenance option than traditional, natural lawns, they do still require some routine cleaning and other maintenance on a regular basis. Here’s what you can expect for weekly and monthly maintenance, as well as how to deal with pet waste and odors, and other special circumstances that may pop up with artificial grass. 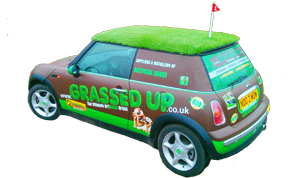 As advertised, artificial grass is extremely low maintenance. In fact, the only routine weekly maintenance necessary is to remove any large debris that might be laying on the surface and to do a light rinse with the hose. After removing any large rocks, twigs or other scraps from the surface of the lawn, a final rinse will remove any dust or smaller debris from inside the individual blades of grass. On a monthly or quarterly basis depending on your family’s normal foot traffic and level of use, you’ll have to do a more thorough cleaning of the lawn. 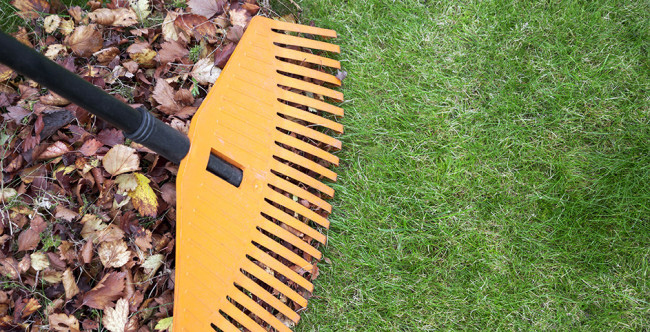 You’ll want to use a flexible, plastic lawn rake and stiff bristled, synthetic broom. Don’t use any steel manufactured cleaning implements as they can seriously damage the surface of the lawn. Rake the lawn to remove the larger particles and then work in a methodical fashion to remove any particles that might be buried deeper in the pile. Finally, run the brush again in the opposite direction to re-position non-erect bristles back into their normal standing position. While it may not seem obvious, artificial lawns actually stand up quite well to the demands of pet use. First, the effect of pets running on the lawn are usually minimal because their paws won’t damage the blades. In some cases, a dog – or any other heavy object – may cause the blades to lay down. This situation can be quickly remedied by using a stiff brush on the area and moving the blades back into place. More to the point, cleaning animal waste from an artificial lawn is pretty much the same process as it is on a natural grass lawn. The bulk of the soilage is removed with a plastic bag or “pooper-scooper” just like on any other surface. Afterward, a disinfectant can be sprayed but a thorough rinsing with plain water from a hose is just as effective at cleaning the area. Lastly, it’s recommended to use a turf deodorizer on a quarterly basis. Artificial lawns are robust but one area where they must be proactively guarded is when it comes to burns. Everything from cigarettes and embers from the charcoal grill to battery acid and strong bases can burn or discolor artificial grass. That’s why it’s essential to keep these items away from you lawn. In other words, do not cook, repair mechanical items or otherwise expose the lawn to harsh chemicals or you could end up having a burnt patch on your lawn that will need repairing. Like any other surface, your lawn will be subjected to any number of stain producing materials including blood, chewing gum, assorted food items and other edible contaminants. You should clean the area as soon as possible to avoid staining. Fortunately, artificial turf is stain-resistant and rarely discolors due to these materials, but keeping the surface clean and attending to any spills or other staining materials is always best practice.